The year has only just begun and I have changed my priorities with my gaming plans already. 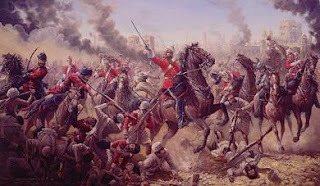 I had planned to start with the Wellington in India project but as I still need to gather figures from Redoubt Miniatures I thought that I would start with the Indian Mutiny. I did state that 2009 and would have a strong Colonial feel and the Indian Mutiny has long been a period I wanted to game, however I could not afford the Foundry range so I have let it slide for many years however Old Glory and their 40% discount have come to my rescue once again. Saturday I ordered 30 packs of British and Mutineers from Old Glory's 25mm range and with postage to Australia it has cost around 27 dollars Australian a pack, thanks to Teressa at Old Glory slipping it all into 2 boxes. I have been reading the Flashman novels for Indian inspiration and these novels as well as the excellent book from Foundry on India have tipped me over the edge. The Foundry book is fantastic and it and another book are the first items I have gotten from Foundry since I recieved a Horde pack of Macedonian Companions as a Slingshot prize for a coiple of Successor articles 4 years ago. The Mutiny project is to take me 6 months, I plan to paint at least 100 figures a month, which I know I can do using Army Painter. The Sudan figures have all been done with Strong tone Army Painter and I found that I could finish 10 British infantry in Khaki an hour. I plan to paint much of the British force in campaign dress, so khaki, white, light grey and scarlet will be the go, the Indian mutineers will be very similar. The Indian Mutiny special in the Spanish wargaming magazine is inspirational, not only in terms of figures but also in terrain, I feel the need for Indian fortress walls and many new buildings as well as new trees and river sections which can all be used for Wellington in India. 5 regiments of British infantry (30 figures each in 3 companies of 10 men, 4 bases to a company). 1 regiment of Highlanders (30 figures organised as above). 1 regiment of volunteers (20 figures organised as above). 3 gun batteries (2 guns each with 4 crew per gun and 1 4 horse limber per battery). 3 cavalry regiments (2 British and 1 Indian each with 2 squadrons of 6 figures, 4 bases to a squadron). 6 command bases (2-3 figures a base). 4 gun batteries (organised as per British guns but 2 batteries are drawn by oxen). 2 mutineer cavalry regiments (organised as per British horse). 4 irregular cavalry units (2-3 squadrons per unit). 9 units of irregulars (10 per units, 4 bases per unit). 6 command bases (2-3 figures per base). 4-5 elephant guns limbers (scratch build limbers, have elephants). Baggage train (10 ox carts and numerous camels). Indian civilians (20-30 on display bases from Eureka Miniatures). Many of the battles during the Mutiny took place near or inside built up areas, therefore I wanted my uniits to be large and with several companies to fight in these areas but I also want them to be multiple bases (2-3 per base). I thought that Piquet FOB with the Zulu War/Sudan company suggestions will be the go but I might swing back to John Company by the Virtual Armchair General (worth getting just for campaign, uniform, battle, scenario and terrain details). I look forward to seeing your progress reports on your Indian Mutiny project.Your deluge reports were inspirational. My club (the Wild Geese in Dublin Ireland) used to game the Mutiny in the 80s and 90s, until our collection was sold on to a possessive gamer and was never seen again. I had some mutiny Brits and added Old Glory mutineers in 2006/7. Before Christmas I invested in more Foundry stuff, as I just had to get camel riders, elephant transports and camel guns. I also bought the Eureka civilians, as they add to the look of a game. My project is due for completion around March, although I suspect a trip to Salute in the UK will see me buying more artillery pieces. I am looking forward to seeing your progress. I was wondering what your method is with the 'Army Painter'? do you just do the standard block painting and thats it or do you apply any further highlights after the dip? Keep up the good work, very inspiring.